As many of you know I have been blessed to be a grandmother to six adorable children, three of which are seventeen-month old triplets. They are so darn cute and so fun now that they are toddling around but I might be a little biased. I have made all my grandchildren handmade quilts when they were born and I finally finished the quilts for these three in time to give them for Christmas. 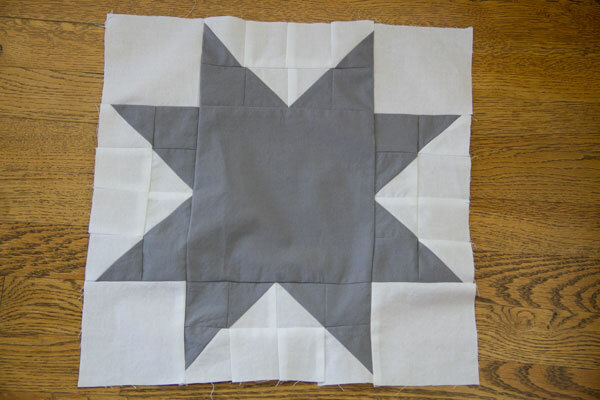 I started with Nora’s quilt and selected pink and gray fabrics. I really like the floral fabric that I used on the back and to bind the quilt. If you look in the lower left corner you can see that I added her name to the quilt. As I was finishing this quilt I bought a new sewing/embroidery machine and was just learning to use it. I was actually at the point where I was getting ready to start the quilting so I only pulled apart this little square to get her name on it. 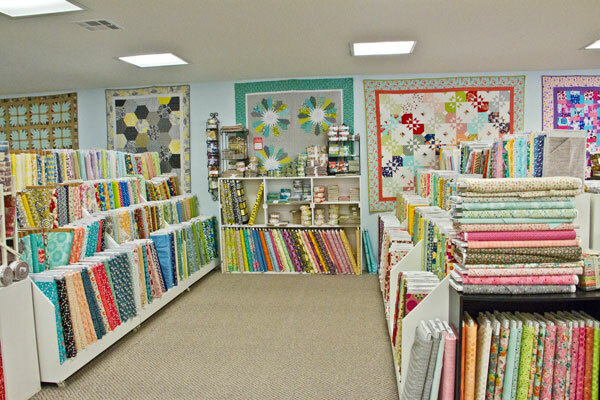 The fabric for the boy’s quilts is from Missouri Star Quilt company in Hamilton, Missouri, my favorite place to shop for quilt fabric. They have the best selection of fabric of any quilt store I have visited in person. Actually the company is made up of twelve different store fronts on Main street with each having their own fabric theme. I bought the fabric for the boy’s quilts in the kids shop and I sure had a hard time making a selection, so many cute choices. As you can see, I had become a little more knowledgeable on my embroidery machine by the time I was making this quilt so was able to add a name block along with the year it was made to both Asher and Bentley’s quilts. In the past I have always hand-quilted or had my quilts machine quilted by someone else. Since I had a new sewing machine I thought I would try my hand at machine quilting these quilts for the boys. It was easier than I thought it would be and it went very quickly since I only used straight line quilting for my first attempt. 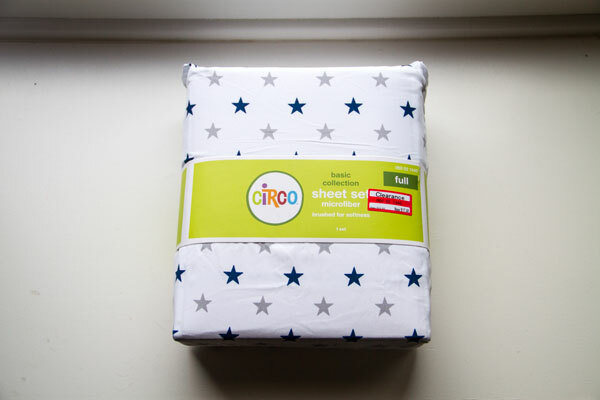 Not sure I would be brave enough to do it on a full size quilt yet but it worked great for these crib size quilts. I have been thinking about what my next quilt will be and am thinking about making one for Dave and I, it has been a long time since I have done that. 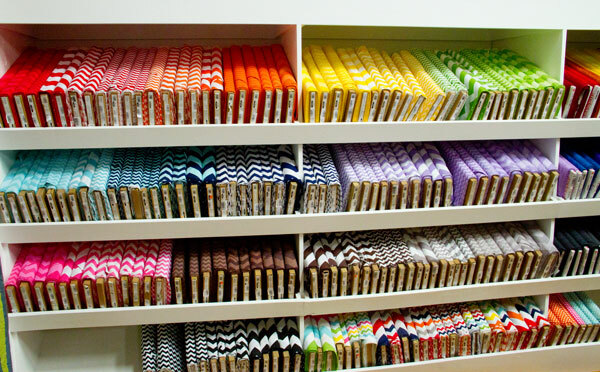 Now to pick a pattern and maybe make another trip to Missouri Start Quilt Company (yea!!!!). Six weeks ago I sent a quilt top I had made to The Missouri Star Quilting Company for machine quilting services. You can read the story behind this particular quilt here. Today it came back to me and I am soooooo excited. I love how it turned out…..here is a sneak peak. This weekend I will be making my binding and completing the quilt. It is funny but binding a quilt is one of the task of making a quilt that I really enjoy. I am not sure why, maybe because it signifies that the quilt is complete. The original vision and all the detail work are finally coming together. Now that the quilt will soon be done I need to get into high gear and finish up the grandkids room that I have been working on including making some window treatments. There never seems to be enough hours in the day to work on all these fun projects! Hope to share the finished room and quilt soon. 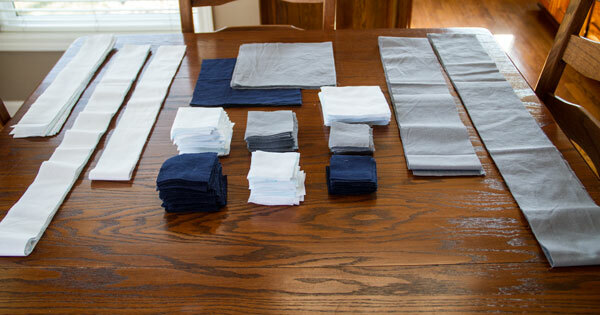 It started with a set of sheets….. I had been thinking about updating one of the bedrooms in our home where the grandkids usually stay when they come to visit. It was still decorated in high-school-girl turquoise and lavender from several years ago when I still had a high school girl living here. I had seen a set of sheets at Target that I liked and had considered buying them but just was not ready to commit to a color scheme. Then one day I walked by and saw this…..
A 40% clearance sticker! Decision made. I picked out a soft grey paint ( Essential Grey by Sherwin Williams) and had the Mr. start painting the room. 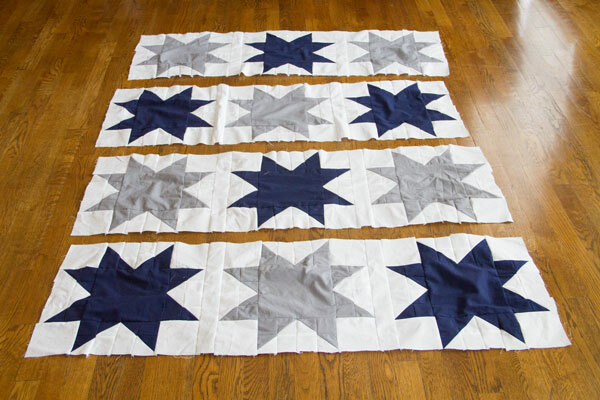 I also knew I wanted to make a quilt for the room and since I had never made a star quilt before thought this might be something to try. As usual, I started with my graph paper and dimensions and came up with a design. Someday I will wise up and just use a pattern but I actually like doing it myself. 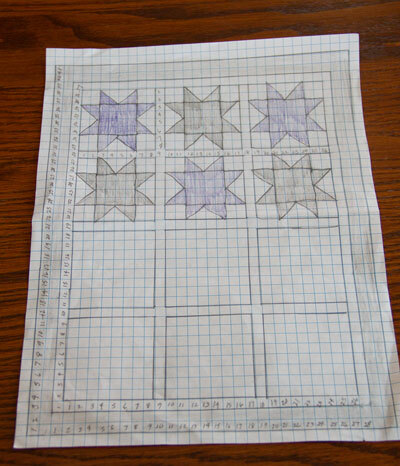 Then, just to be sure my design and dimensions would transfer appropriately to fabric, I made one of the quilt squares. Satisfied that the design would work, I determined the size of all the pieces I would need and started cutting out the fabric. Cutting fabric is my least favorite part of making a quilt, but I love having it all done at one time. Dave was getting ready to go out of town for a few days so I set up my sewing machine in front of the tv and each night after work I sat down to sew and literally watched 14 back episodes of Fixer Upper. My kind of fun! In this picture I had sewn all the squares and attached the inner borders to make rows. I then sewed the rows together and attached the outer borders. I knew when I started this quilt that I was going to have it machine-quilted but at the time I was not sure where I would take it. The last time I asked the person who had machine-quilted three other quilts for me, she had a six month long waiting list. Then I remembered that the Missouri Star Quilting Company, a place I visited last year (see that post here), will do machine quilting for a very reasonable price. On their website all you do is enter the dimensions of the quilt, pick out a quilting pattern, batting and a backing fabric if needed. You can also have them bind the quilt although in this case I want to bind the quilt myself. Then you just pack the quilt up and send it to them. Your quilt top arrived safe and sound. We have delicately hung it up and it will soon be mingling with the other wonderful quilts. The final step in the journey to becoming a masterpiece is getting closer every day! Your quilt displays wonderful craftsmanship and precision. You should be proud! Thank you for letting us be a part of this beautiful quilt! We will handle it with great care and treasure it as if it were our own! I am sure this is probably a canned response they send to all their customers but just knowing they had received it and would be handling it with care set my mind at ease. Now I cannot wait to get it back…..they say it will take 4-6 weeks but I am sure hoping it will be sooner. In the meantime I need to make about 24 feet of binding so I will be ready when it is returned! Pictures coming soon of both the room and the finished quilt. A few weeks ago by sister, brother-in-law, Dave and I took a day trip about an hour or so north of Kansas City to a small town called Hamilton, Missouri. Prior to 2008, this small town was best known for it’s most famous son, J.C. Penney, a retailer and philanthropist. In late 2008, a phenonomon was starting when some kids got together and bought their mom a long arm quilting machine. They had no concept of what was to come. I had become acquainted with the Missouri Star Quilt Company by one of the many free quilting tutorials Jenny Doan showcases on YouTube. 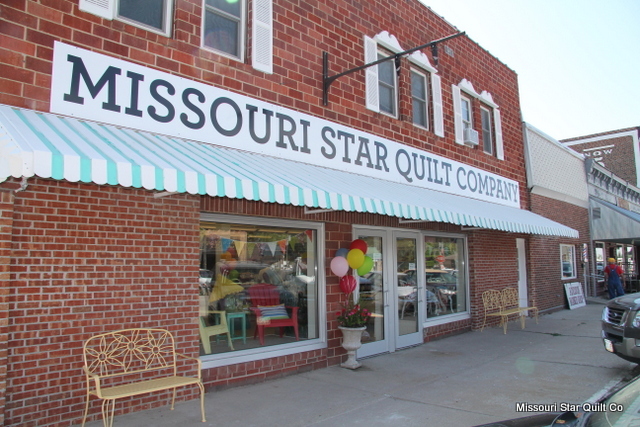 The name “Missouri Star” is an old quilt pattern so I assumed that is where the name came from and did not realize their retail store was actually in Missouri and not far from my town. My sister and I were very excited about finally getting to visit the retail store in person, but after walking through it I have to admit I was a little disappointed. It was a nice store but very similar to other quilt stores I had been to even in my own town of Kansas City. As we were paying for the fabric and notions we had bought, the clerk mentioned that we need to walk down the street and check out another store. Since we made the drive we figured it would not hurt to see what else was in the town. 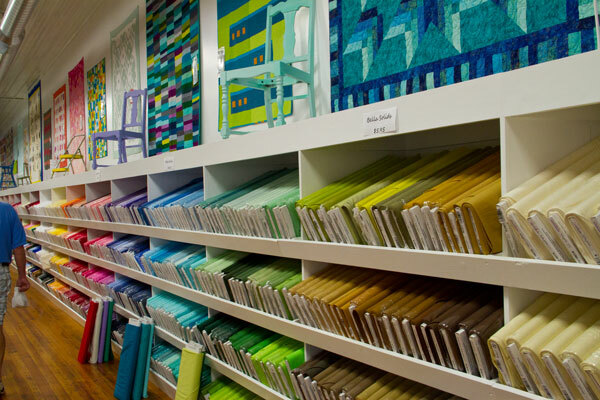 We were flabbergasted…….there are about 15 different store fronts, all fabric stores. One devoted to solid fabric, one devoted to licensed sports fabrics, one with modern patterns, and the list goes on. And yes, these are all part of the Missouri Star Quilt Company. There are a handful of other stores in town, but ninety percent of Davis Street, Hamilton’s main drag, belongs to the Missouri Start Quilt Company. 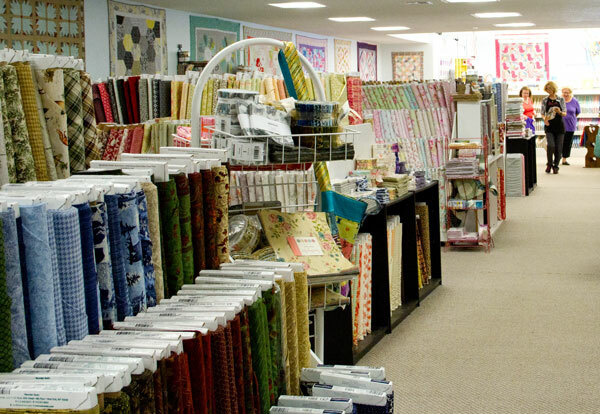 When I say it is a mecca for quilters throughout the world, I am not exaggerating. 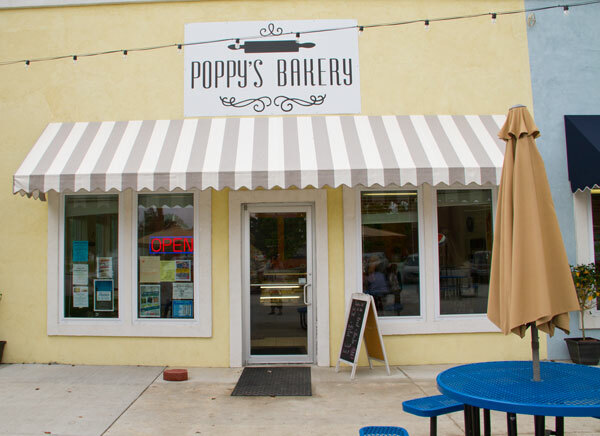 This sleepy town of about 2000 citizens hosts thousands of on-site visitors each year. Missouri Star Quilt Company employes 180 people who sew, staff stores and ships thousands of packages a day. The company is now in the publishing business, food service and is currently planning a “man’s land” to give the husbands of their customers something to do. What a story this small town now has! And for me is it exciting to know that success stories can happen even in the most unlikely of places. 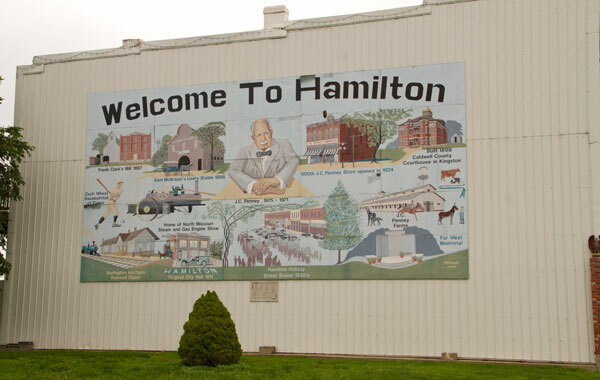 Hamilton is a fun day trip from Kansas City especially if you like to sew or quilt. I can not wait to go back!